Bonjour Indianapolis! Tu parle Francais? Speaking French certainly isn’t necessary for a stop at Indy’s newest restaurant – Cropichon et Bidibule. 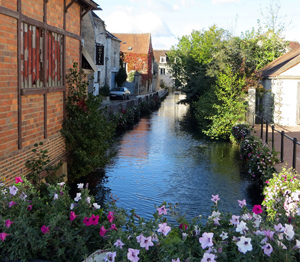 A taste for French food, a love of crepes, or even a slight sense of adventure will serve diners better than linquistics. The dining area, including this bar, can seat up to 80. Musicians and French nationales Stephane and Cathy Coueffe have renovated a beautiful spot near Mesh restaurant on Mass Ave. The restaurant opened Mar. 3 so they’re still working out a few kinks. A mid-afternoon lunch was a delightful experience. The bright dining room with hints of black and red – and a few Parisian decor items delivered while I ate – is most attractive. The menu features starters like charcuteries and fromages – or meats and cheeses. Any of five choices in either category cost $12. But the highlight of my lunch was clearly the crepes. I had a wonderful Gallette Complete for $9 of cured ham, gruyere cheese, and a soft-centered fried egg. It was a perfect ham and cheese lunch if you want to dumb it down a bit. But with the beautiful presentation its a shame not to put on your best French accent, or even Pepe le Pew, and soak up the relaxed atmosphere. 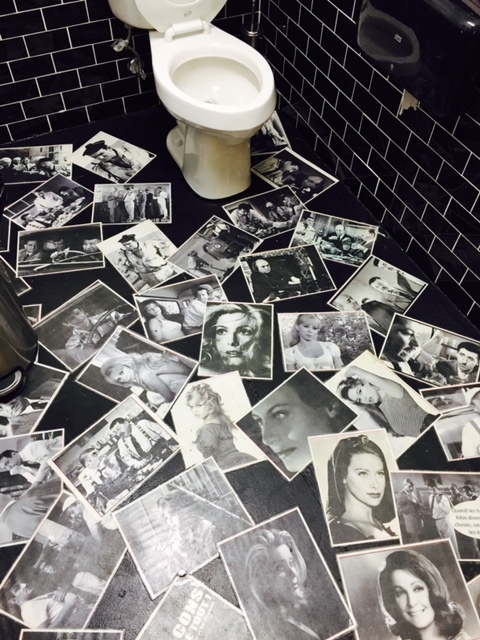 The whimsical floor of the men’s room – covered in photos from French films. Crepes come in two variations – the Gallettes are a buckwheat flour crepe that nationally gluten free and goes well with savory foods. The restaurant imports its buckwheat flour for a real authentic feel. The crepes you may, or may not, know will be more familiar on the opposite side of the menu. Ranging from $5-$7, the traditional crepe makes an excellent snack or dessert. I enjoyed the $6 Le Crepe a la Creme de Cirton Faite Maison – or a crepe with lemon cream and red raspberry. It’s a treat you just can’t find at your local tenderloin joint. The dinner menu features small and large plates of traditional French cuisine. The small plates range $6-11. The large plates, or dinner items, features many French staples like beef burgundy, duck breast, cured pork and pork belly, poached cod, and steak frites. Dinner entrees range $18-26. The food was really delicious. Not being a huge crepe consumer, I can just say I liked them a lot. They have a traitional billig – or crepe making device. The crepes can be served open faced, which is traditional, or even as a wrap known as street style. And if you never have had a crepe, just think really light pancake. There remain a few kinks but the staff was extremely cordial and responsive. I ordered the Gruyere/Onion soup. It was delivered with a warning it might have too much pepper. It did and the staff quickly brought a beautiful salad of fresh greens. They later brought me a bowl of the chef’s take on French onion soup revisited and it was wonderful. That soup alone is reason for me to return. The wine list impressed me for the variety and dedication to French wines. There were a few non-French choices, wines from most of the major wine producing areas were available at reasonable prices – most at $8-$10 per glass. The by-the-glass program featured seven whites and nine reds. General Manager Scott Ramsey, who also manages the wine list, wants to serve primarily French wines but also wanted a big by-the-glass list to introduce French wines to his restaurant guests. Indianapolis once had two or three really great French restaurants – all now gone. There is a spot or two doing crepes and the Bijou in Lebanon still going strong. 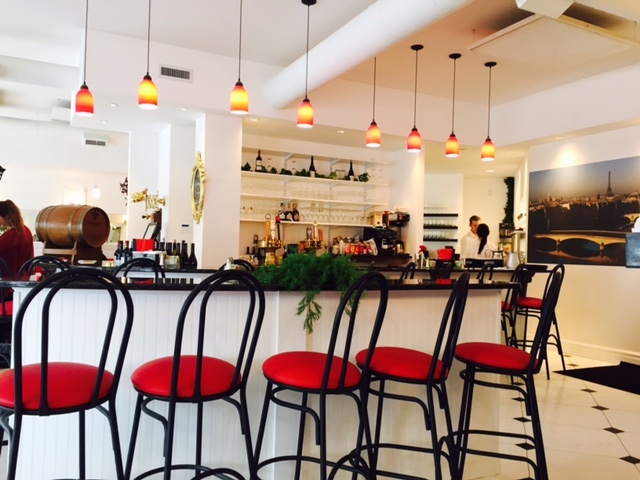 Cropichon et Bidibule brings something to Indy badly needed – authentic French cuisine. Oh, the name? Well folks are going to struggle with that but its the nicknames of the couple’s two children.